With clinical reasoning, students focus on one particular disease to learn more about various aspects of the disease. This is accomplished by studying the patient's medical history and physical examination, suggesting a diagnosis and applying treatment, and learning more about the mental health of the patient and the patient's family. It also includes observing the physician's professional conduct, and utilizing a Problem-Based Learning (PBL) style. This process aims to enhance a student's communication ability so they can not only skillfully present their own opinions but also carefully listen to the opinions of others. We offer students opportunities to apprenticeship in nursing care and in the physician's clinical duties during the early stages of their studies. By witnessing these clinical scenes, it helps cultivate a student's professionalism as a medical practitioner and enhance their motivation towards the study of medicine. During summer vacations, students are offered to participate in the extra curricular activities both in the basic science departments and clinical departments. There are more than 100 programs that the students from any academic year can participate in. 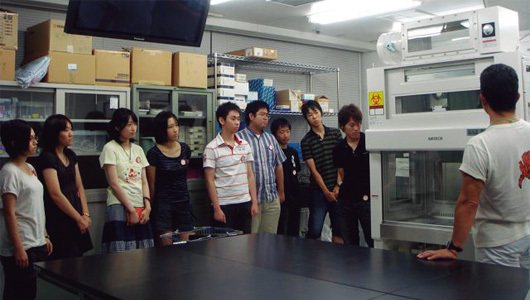 Since 1995, Saitama Medical University (SMU) has been conducting a student exchange program and is currently connected to ten medical schools overseas. With this program, SMU sends two 5th year students each to ten different overseas schools where they engage in bedside learning practices for four weeks during the month of August. Reciprocally, the ten overseas schools send two students each to SMU for four weeks of similar training. Because the number of applicants regularly exceeds those accepted each year, selection is based on interviews and the students' proficiency in English. From March through July, successful applicants study communication skills and medical English by attending two seminars at Ogose and Kawaguchiko, and by participating in SMU's English Café. During their stay overseas, the exchange students not only glean the most fruitful clinical training practices, but also expand their understanding of a new culture. The ingenuity of the program helps students to develop as a physician with a broader view of medical practices in an international arena. In total, 699 students have participated in the program from 1995-2014. This is a short-term intensive English program, which started in March 2007. The purpose of this program is to develop students' English knowledge and skills in relation to their health-science studies. During the program each student stays with a local family to help improve their communication skills, while giving them the chance to learn about another culture. The program is conducted for two weeks in March every year, and it's offered to students from both the Faculty of Medicine, and the Faculty of Health and Medical Care. In the past, the program took place in Melbourne (Australia), San Francisco (US), and the Gold Coast (Australia). Currently, it is being offered in Los Angeles (US). The program includes the following modules: oral communication, medical terms, presentations, research, hospital visits, as well as communication with doctors, nurses, other health professionals, medical students, and nursing students. 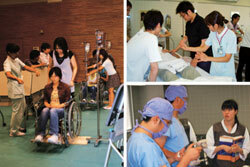 Saitama Medical University offers its faculty a unique opportunity to study abroad. Five candidates selected by the committee of International Education and Training Center each year are eligible to study at overseas hospitals/institutions for up to 3 months with full salary. This program started in 2009 to promote our university's educational, research and clinical activities in an international environment. 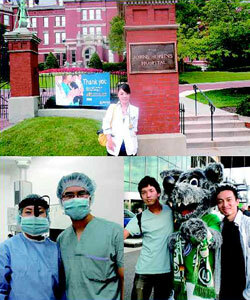 The goal of this program is to raise competent medical practitioners with an international perspective. Far their study destinations, faculty members can select either the location of their choice, or they can participate in the "Faculty Exchange Program" which includes several overseas universities who have signed an exchange agreement with SMU. Overseas institutions that have participated in this program are the University of Pecs (Hungary),Semmelweis University (Hungary) and Chang Gung University (Taiwan).